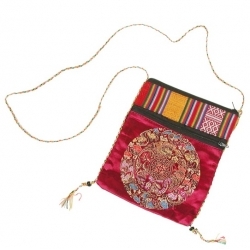 Mala bags are used to protect malas from dust,dirty hands,insects etc. This colorful satin dragon mala bag features an embroidered design of a mandala surrounded by beautifully illustrated dragons. The bag has two zipper pockets, one on the side and one at the top. Size is approximately 6 x 8 inches. Choose color and quantity above. 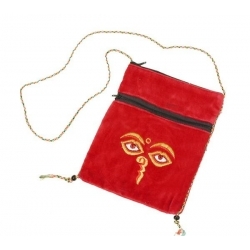 The traditional design of Eyes of Buddha is embroidered on to the velvet cloth bag. This bag has two zipper pockets, one on the side and one at the top. It can be used as purse or simply a safe place to items. Size is approximately 6x8 inches. 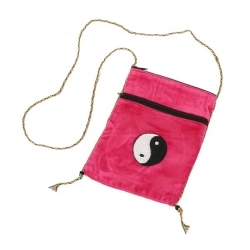 Yin Yang, the ancient symbol of harmony and balance is nicely embroidered on to the velvet cloth bag. This bag has two zipper pockets, one on the side and one at the top. It can be used as purse or simply a safe place to items. Size is approximately 6x8 inches.